This post contains affiliate links. Please find my full disclosure here. I discovered oilcloth years ago, and used it to make bibs for my twin girls when they were babies. Oilcloth is a tightly woven fabric that has a 100% cotton backing, and the top is treated to make it waterproof. I knew it would be just the thing for my outdoor bunting, which I wanted to hang along my porch for the fall season. I love it so much though, I think I’ll make some more! 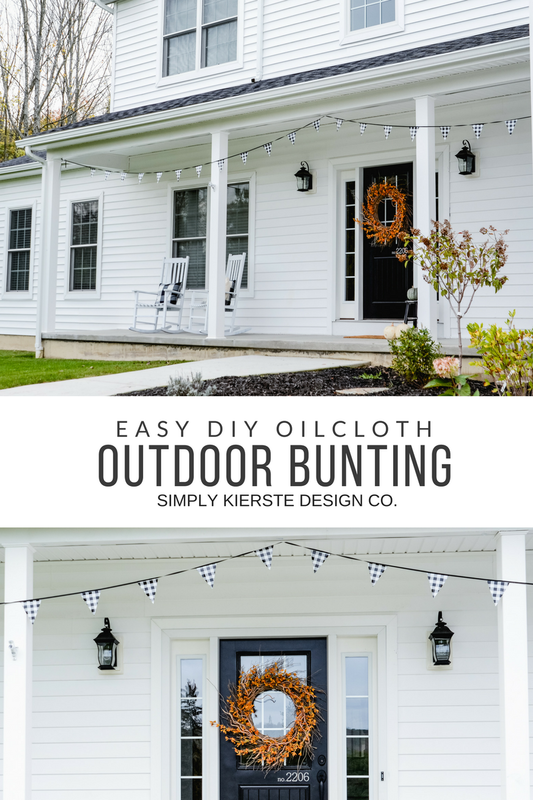 My DIY Oilcloth Outdoor Bunting is super quick and easy to make, and you’ll love all the possibilities! Isn’t it ADORABLE? I’m seriously in love with the black gingham! I knew it would be perfect for fall and Halloween, but it’s pretty versatile. 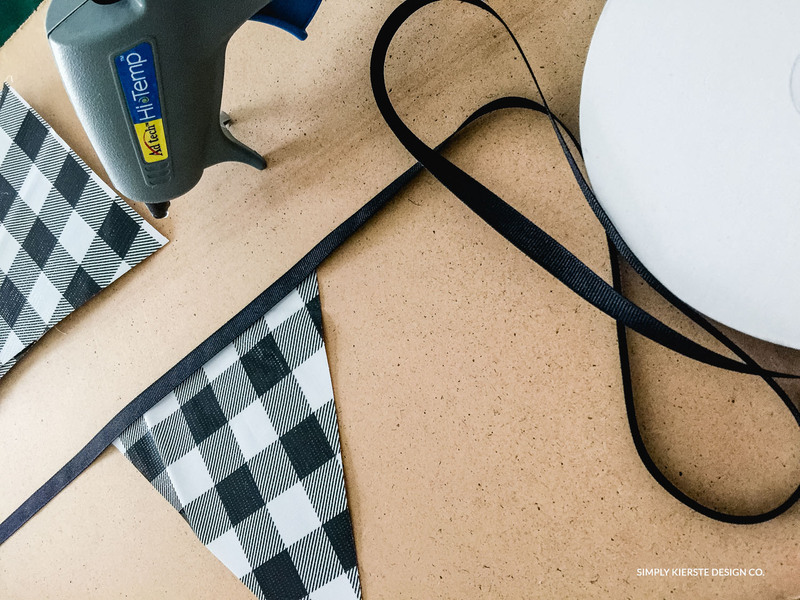 I am not kidding…this is the easiest project, and I can think of so many reasons to need an outdoor bunting. Whether you want it on a front porch or back patio to decorate for the season, or you want one for a party or gathering, this is a great solution. In hindsight, I’d make the pennants a little bit bigger (these are 6 inches), but I wasn’t sure when I was making them. I still love them, but I’ll probably make them 8 inches or so next time. Here’s how to put it together…it’s really as simple as 1…2…3! I bought a yard of oilcloth, and it was enough to make the bunting that goes across my 40 foot porch. My pennants are 6 inches wide, and I placed them approximately every 15 inches. I did have a little fabric left. Hopefully that helps you decide how much you need! It comes in a variety of patterns, but I’m a sucker for gingham. It’s my favorite! I used my Silhouette Cameo to cut out 6 inch pennants. I can’t share the file with you, but if you have one, just search for bunting in the library, and it will come right up. I went back and forth between doing the triangles or the scallop…there are some fun options. If you don’t have a Silhouette, no worries! A quick google search gives lots of options for free templates that you can print and cut, then use to trace on your oilcloth (on the back) and cut out. Once I had the pennants cut, I was ready to glue them to the grosgrain ribbon. I love grosgrain the best for this project because it’s durable, a little thicker, and has a nice edge to it. It comes in a variety of widths, and if you like wider than 3/8 inc, you certainly can use it. I have a 40 foot porch, so I bought a 50 yard spool so it would be in one long piece. I found it on Amazon for $6, which is a great deal compared to in-store. Unroll the spool, and give yourself quite a bit of extra ribbon for the end of the bunting, to tie up when it’s finished. 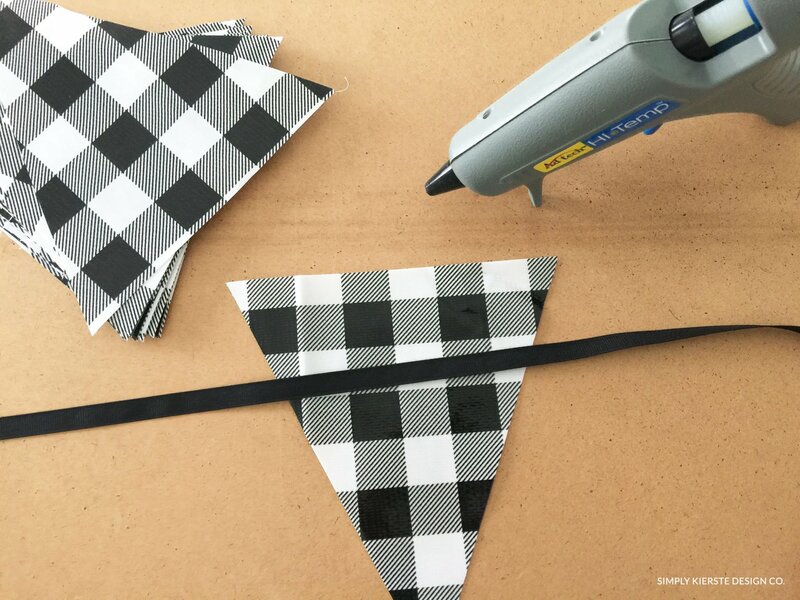 Once you’ve found where you want to start, place a line of hot glue right along the top of the pennant, then carefully place the grosgrain ribbon down so it meets the top of the oilcloth. Decide how far apart you want your pennants, then measure that space, and repeat the process. 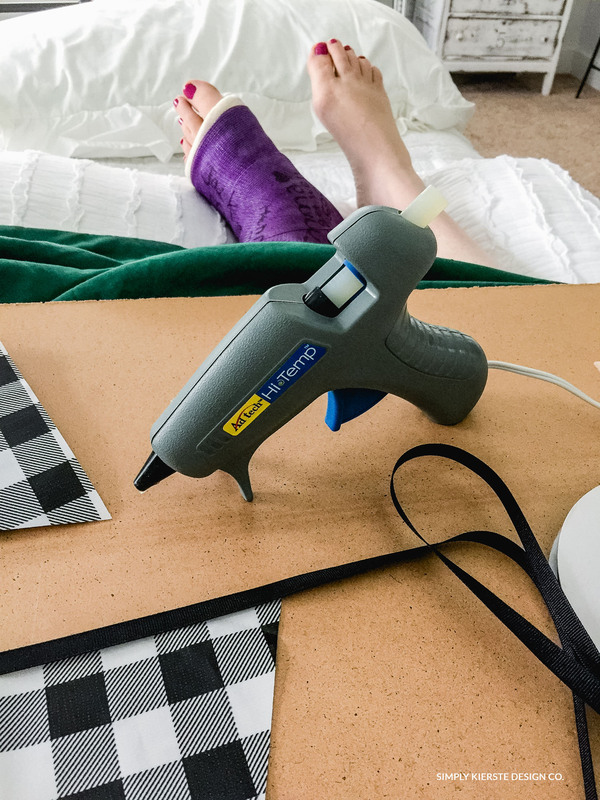 And you’ll appreciate this…I actually made this soon after I broke my leg/ankle, and my hubby made a work station for me in my bed! Repeat until your bunting is as long as you want it to be, then make sure you leave a bunch of extra ribbon the other end as well. You can always cut it shorter, but you can’t make it longer, so be generous. And that’s it! 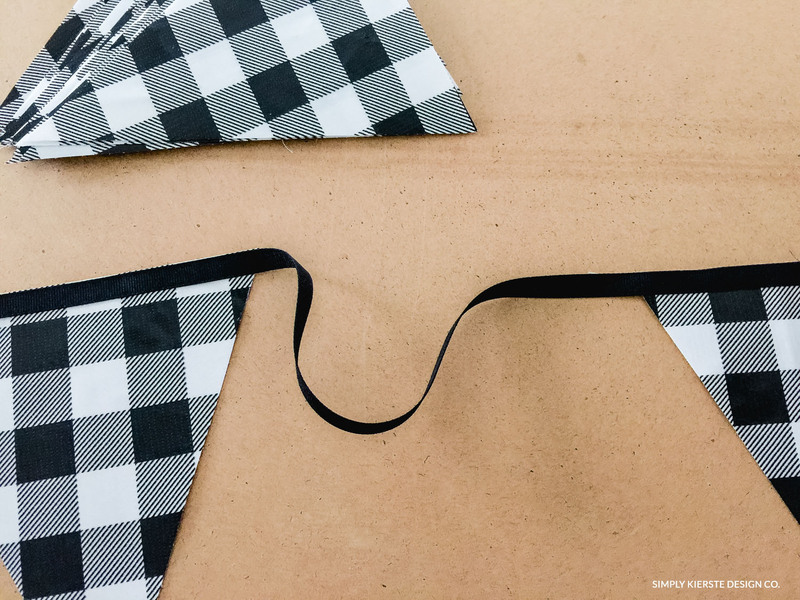 You’ve got an adorable outdoor bunting! To hang the bunting, I love using the Command Wire Toggle Hooks. They go on the back side along the top of the porch. I hooked it in the middle, then tied it on to either end. I leave them up all year long–they’re how I hang up my porch string lights, greenery, etc. They do great outdoors–mine have been up for a year, and have weathered a very cold winter and summer too. I think it adds so much to my porch…love it! Super cute idea! I am so happy I found your blog! This is so cute for the coming fall! 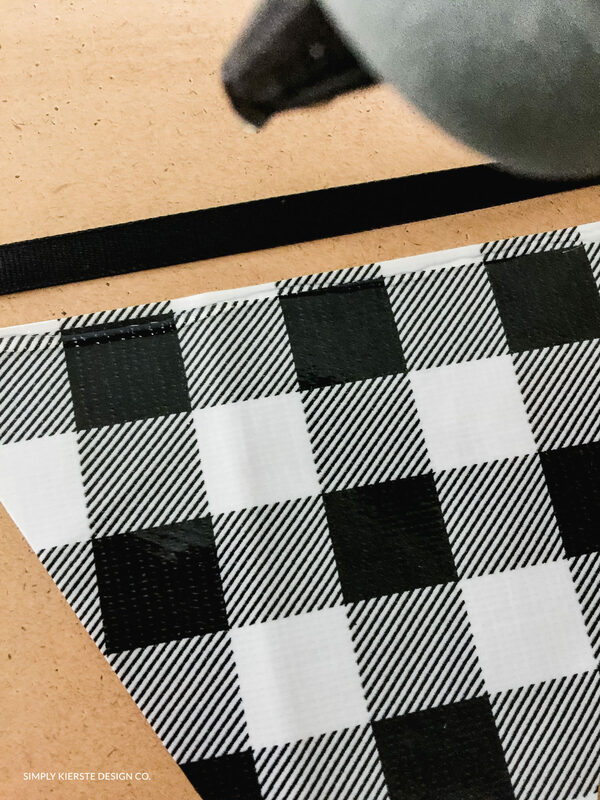 Where did you find the black gingham oilcloth? When I click on the link you gave it is not working. Thanks so much! Hi, Jen! I think what I ordered is no longer offered. However, I did find it a few places when I did a search. It depends on how large you want the check to be…it’s easier to find a smaller gingham check than the larger. Thank you so much for getting back to me and for all the links! I would love to find the large check so I will keep checking back to see if they get any more of that in. If not I will just go with the small.